GM Wheat: A Health Risk Or A Way To Feed The World? UK scientists working to develop genetically modified wheat at Rothamsted Research in Harpenden, Herts are facing a problem — but it is not a problem with their research, rather it’s protestors potentially ruining their experiments. The team is working on a wheat that is genetically modified to deter aphids, and a group called Take the Flour Back has vowed to “decontaminate” the site unless the research is halted. The protestors hold that the strain could spread nationwide, which would put non GM crops at risk and pose potential health issues to those that consume it. However, the scientists are being very open with their research and have invited protestors to come in for a chat to see for themselves what theses experiments are trying to achieve. “The other thing is that they’re using an antibiotic resistance gene as a marker in this trial, and in many parts of the EU that’s considered quite outdated science now because you can get gene transfer into bacteria and so on,” she added. So there you go, two sides, two important concerns – but which is the right one? It is important to note that this isn’t the first time wheat has been modified. During the 1960s, Norman Borlaug combined elements from several wheat species to create ‘dwarf wheat’. This species was able to produce heavy yields without growing too tall and being blown over by the wind and rain. The creation transformed India, which at the time had been ravaged by drought and overpopulation, and thanks to Borlaug’s work the wheat crop increased from 11 million tons to 60 million tons. Borlaug won the Nobel Peace Prize in 1970 as well as the Presidential Medal of Freedom, the Congressional Gold Medal and the title “father of the Green Revolution“. So what makes the UK team’s work any different from Borlaug’s in terms of creating a modified wheat that could have massive benefits for the planet? The team’s wheat contains genes that have been synthesised in the laboratory, an approach that is more common than transferring genes from other organisms. By doing so, their wheat will produce a pheromone called E-beta-farnesene which wards off aphids. 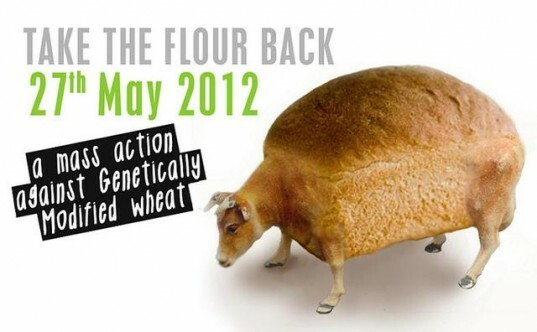 However the campaigners are saying the team’s “wheat” contains cow genes. According to a BBC report, this gene is a promoter gene, which switches on other genes and is asynthetic variant of one found in many organisms, including wheat itself. The researchers explained that they chose a variant closer to the cow version than the wheat one in order to prevent other genes in the wheat recognizing its activity and regulating it. So what do you think? Is it wrong to modify wheat in such a way or is it possibly the only way to feed the planet with its ever-growing population? The problem is that GMO technology is mostly a Trojan horse for large companies wishing to sell more pesticides. And there is a serious lack of knowledge related to pesticide residues pressent in those crops. The GMO technology could also sometimes pose problems in itself, if the protein syntehsized was one that has a health impact. Meanwhile the large companies have developed a well-honed strategy to kill public genetic research in all countries, telling governments, we can take care of that science. Public science has been weakened and threathened, so that even if there existed a risk, there are no scientists any more in the public system in a position to investigate and demonstrate it. What gives me permission to say that is that I am a public system geneticist, and that my position will be abolished soon, much against my own wishes; and it happens at a time when I was becoming able to demonstrate new methods that are more fruitful than GMOs to develop plants that need zero pesticide. There is no logics in terminating that work except to make room for the trojan Horse of the GMOs. Valid GMO research exists; some of it could have real value for our common future. But there was a premature move to put too much in the hands of the private. So the "big plan" to make it a private venture is what creates an enormous risk. Moreover, the private is allowed a lot of hype. GMOs will definitely and emphatically NOT save the world against any current threat. Genetics is much more complicated than those new magicians claim, and many of the sciences needed to do good genetics are at risk of disappearing. Plant pathology for example is a shadow of what it once was, in many countries. I was always pro-GM and so far I see no reason to think otherwise. People have been manipulating genes of other organisms for quite a while now. Best example - dogs. There are that many different kinds of dogs because of selective breeding, which is nothing but a slightly longer version of GM. The result is the same, you get the genes you wanted in the organism. With direct GM, you have an even more precise way of controlling exactly what you want to gain. I don't really see a whole lot of danger when using GM objects. It's not like you integrate the genes of what you eat into your DNA (eat beef, become a cow?..). So by using GM objects you can only make your health better, as many of them (like golden rice) contain extra nutrients. The concern for the environment is a bit more valid. If GM organisms are still capable of cross-breeding, then your genes may leak into the wild, which means that part of the wild organisms will now have the benefits enjoyed by the GM organisms. It may be a bad thing, or it may be a good thing, it's hard to predict. For pesticide use being higher - it's not the fault of GM by itself. It's the fault of the farmers. GM organisms are a lot more resilient. They can resist pests, and they can resist chemistry. Which means that if you add more pesticides, it won't die as fast as the original strain. Hence the farmers add it to be safe, making their yield poisoned. But there was no reason to use them to begin with. And don't forget that the chemistry industry is strong and does not like losing money. They will fight against GM as much as they can, claiming to have legitimate reasons, while the real reason is that they want to sell more fertiliser, more pesticides, more other kinds of chemistry to get more money. 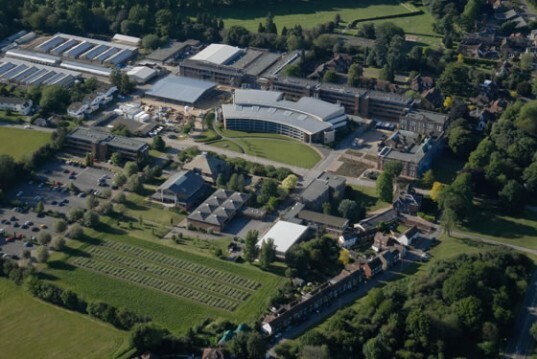 UK scientists working to develop genetically modified wheat at Rothamsted Research in Harpenden, Herts are facing a problem -- but it is not a problem with their research, rather it's protestors potentially ruining their experiments. The team is working on a wheat that is genetically modified to deter aphids, and a group called Take the Flour Back has vowed to "decontaminate" the site unless the research is halted. The protestors hold that the strain could spread nationwide, which would put non GM crops at risk and pose potential health issues to those that consume it. However, the scientists are being very open with their research and have invited protestors to come in for a chat to see for themselves what theses experiments are trying to achieve.